After 33 years in exile in Texas, this child of the Pacific Northwest has returned to the north, only this time I make the Northeast my home. Bruce and I are gradually settling in to his childhood homestead in upstate New York. The light here is deeply familiar to me. The rolling hills of the Catskills are not unlike the foothills of the Cascades, (under whose shadow I came of age). The greatest difference being that, beyond the Catskills, there are no looming mountains, no Mount Baker, no Mount Rainier, (and I have now learned the difference between “eroded plateau” and “glacial peaks”). As we edge towards the Winter Solstice, the other great difference is in the trees. I grew up amongst the evergreens, and now am truly seeing the change in the Autumn landscape with the deciduous trees. We live in a “bowl”, immediately surrounded by mountains. Last weekend I watched the supermoon set over the mountain across the street, before the sun showed its face over Mount Guardian in our backyard. As the moon set, (forgetting that the silhouette of the mountain was actually the tops of the leafless trees), I expected the complete disappearance of the moon. Instead, I was struck with the view of the moon through the naked trees, before it finally sunk behind the mountain. My new life here is filled with miracles like this every single day. Many people move to new homes upon retirement, this is nothing new. We however, while near the age of retirement, (Bruce is 67, I still have a ways to go at 53), do not have that luxury. We devoted our lives to being freelance musicians, and our years crept up on us. Oops. What do you mean we are not at the beginning of this journey? We’re just getting good at what we do. And there is this house to fix up. 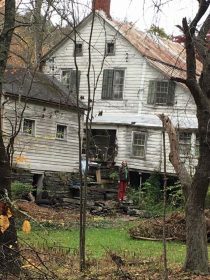 A 200-year-old farm house in need of great attention. A house full of ghosts, and boxes, and heavy emotions. A beautiful place, with much history in its bones. I am truly now beginning to grasp just how deep Bruce’s carpentry skills run. He has already reseated a toilet, downed a massive ash tree, fixed the stubborn front door, pulled down and refinished a kitchen cabinet, relaid floorboards in the front hall, taken down a rotting porch roof, and repaired a 150-year-old surface-mount door-lock. He is frustrated at times that he is not completing any one task, because every repair leads to other repairs. This is a lifetime of work here. But as some say, “There’s them that can, and them that know how”. Bruce knows how. —and so we hustle. We rehearse. We continue to knock on doors (virtually and in person).